JewishWorldReview.com | Just before Russian President Vladimir Putin orchestrated Russia's takeover of Crimea, the US's Broadcasting Board of Governors that controls Radio Free Europe and Radio Liberty announced that it will be ending its broadcast to Iraq and the Balkans next year. And this makes sense. As far as the Obama administration is concerned, Iraq ceased to exist in 2011, when the last US forces got out of the country. As for the Baltics, well, really who cares about them? Russia, after all, wants the same things America does. Everything will be fine. As Obama said to Governor Mitt Romney during one of the 2012 presidential debates, "The 1980s are now calling to ask for their foreign policy back because the Cold War's been over for 20 years." During the election, Obama was famously caught on an open microphone promising President Putin's stand-in Dmitry Medvedev that he would have "more flexibility," on missile defense after the presidential election. He asked Medvedev to ask Putin to give him "more space" until after November 2012. With a five-and-half-year record of selling US allies like Poland, the Czech Republic and even the Syrian opposition out to please Putin, it should be obvious that Obama will do nothing effective to show Putin the error of his ways in Ukraine. Obama doesn't have a problem with Putin. 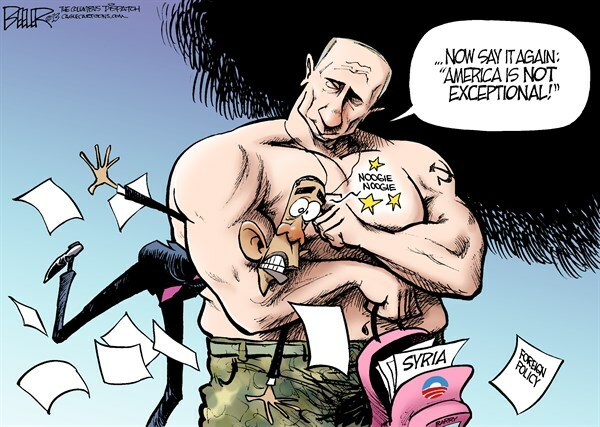 And as long as Putin remains anti-American, he will have no reason to be worried about Obama. Consider Libya. Three years ago this week, NATO forces supported by the US began their campaign to bring down Libyan dictator Muammar Gaddafi. As Patrick Coburn noted in The Independent over the weekend, the same Western forces who insisted that their "responsibility to protect" the Libyan people from a possible massacre by Gaddafi's forces compelled them to bring down Gaddafi and his regime have had nothing to say today about the ongoing bloodbath in post-Gaddafi Libya. Libya is disintegrating today. There is no central governing authority. But Gaddafi, the neutered dictator who quit the terrorism and nuclear-proliferation rackets after the US-led invasion of Iraq, is gone. So no one cares. Coburn mentioned the recent documentary aired on Al Jazeera - America that upended the West's narrative that the bombing of Pan Am 103 in 1988 over Lockerbie, Scotland, was the work of the Libyan government. According to a credible Iranian defector, the attack was ordered by Iran and carried out by Palestinian terrorists from Ahmed Jibril's PFLP-GC. He wrote, "the documentary emphasizes the sheer number of important politicians and senior officials over the years who must have looked at intelligence reports revealing the truth about Lockerbie, but still happily lied about it." If the Al Jazeerah documentary is correct, there is good reason for the public in the US, Europe and throughout the world to be angry about the cover-up. But there is no reason to be surprised. Since its inception, the Iranian regime has been at war with the US. It has carried out one act of aggression after another. These have run the gamut from the storming of the US Embassy in Tehran and holding hostage US diplomats for 444 days, to the use of Lebanese and Palestinian proxies to murder US officials, citizens and soldiers in countless attacks over the intervening 35 years, to building a military presence in Latin America, to developing nuclear weapons. And from its earliest days, the same Iranian regime has been courted by one US administration after another seeking to accommodate Tehran. A similar situation obtains with the Palestinians. Like the Iranians, the PLO has carried out countless acts of terrorism that have killed US officials and citizens. From the 1970 Fatah execution of the US ambassador and deputy chief of mission in Khartoum to the 2003 bombing of the US embassy convoy in Gaza, the PLO has never abandoned terrorism against the US. No less importantly, the PLO is the architect of modern terrorism. From airline hijackings, to the massacre of schoolchildren, from bus bombings to the destabilization of nation states, the PLO is the original author of much of the mayhem and global terrorism the US has led the fight against since the 1980s. And of course, the PLO's main stated goal is the destruction of Israel, the US's only dependable ally, and the only liberal democracy in the Middle East. Yet, as has been the case with the Iranian regime, successive US administrations have courted, protected and upheld the PLO as moderate, reformed or almost reformed militants. In many ways, then the Obama administration is simply a loyal successor of previous administrations. But in one essential way, it is also different. IN A 2006 op-ed in The Wall Street Journal, civil rights historian Shelby Steele argued that the reason the US has lost every war it has fought since World War II despite the fact that it has had the military might to vanquish all of its enemies is "white guilt." White guilt, he argued, makes its sufferers in the West believe that they lack the moral authority to act due to the stigma of white supremacy and imperialism. Writing of the then raging insurgency in Iraq, Steele explained, "When America - the greatest embodiment of Western power - goes to war in Third World Iraq, it must also labor to dissociate that action from the great Western sin of imperialism. Thus in Iraq we are in two wars, one against an insurgency and the other against the past - two fronts, two victories to win, one military, the other a victory of dissociation." This neurotic view of America's moral underpinning is what explains the instinctive American tendency to strike out at those who do not oppose the West - like Gaddafi's regime in Libya and Hosni Mubarak's regime in Egypt - while giving a pass to those who do - like the Palestinians and the Iranians. But whereas white guilt has afflicted the US leadership for the past several generations, past administrations were willing to set it aside when necessary to advance US national security interests. This cannot happen with Obama. Obama owes his presidency to white guilt. His promise to American voters was that by voting for him, they would expiate their guilt for the sins of European imperialists and southern racists. It was the American desire to move beyond the past that enabled a first-term senator with radical connections and the most liberal voting record in the Senate to get elected to the presidency. But tragically for the US and the free world, Obama's worldview is informed not by an appreciation for what Steele extolled as America's "moral transformation," on issue of race. Rather it is informed by his conviction that the US deserves its guilt. Obama does not share Bill Clinton's view that the US is "the indispensable nation," although he invoked the term on the campaign trail in 2012. From his behavior toward foe and friend alike, Obama gives the impression that he does not believe the US has the right to stand up for its interests. Moreover, his actions from Israel to Eastern Europe to Egypt and Libya indicate that he believes there is something wrong with nations that support and believe in the US. Their pro-Americanism apparently makes them guilty of white guilt by association. So Iran, the Palestinians and Russia needn't worry. Obama will not learn from his mistakes, because as far as he is concerned, he hasn't made any.